Squeezing Blackheads – How to do it the Right Way! Blackheads! Possibly the most annoying skin condition based on stubborn-ness! Once they’re gone, you can concentrate on refining the pores and preventing them from filling up again. What Blackheads Should You Be Squeezing? Some blackheads really do benefit from a good squeeze. The ones to concentrate on are the old ones – extra ‘black’ and stubborn. Because you’ll be dissolving them with the right exfoliation this will help the process along. However, don’t be tempted to squeeze every blackhead you see! Start by only targeting the most open, obvious pores – the darkest and most stubborn. Ready? 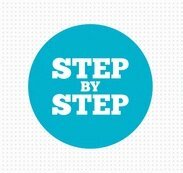 Here’s how to do it step by step! Sometimes you can squeeze a few quickly then dust them off with a tissue! Remember: if it doesn’t come out easily, leave it. Too much will cause damage to the skin and do absolutely nothing to get rid of the blockage. If you are extracting in a fairly large area, try to spread the squeezing out a bit to avoid irritating the same area of skin. Often a blackhead extractor tool is the easiest thing to use on the nose. 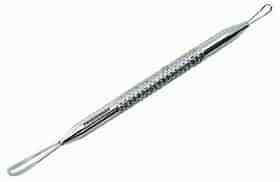 These little stainless steel tools* are often used in professional facials. They allow a specific, targeted pressure, which can extract a blackhead much easier. This will either remove the whole plug, or loosen the blockage significantly so you can finish with a light squeeze. Best way to use one – place the hole over the blackhead, and put most of the pressure on one side – almost a scraping motion. This pushes the plug out a lot easier than simply pressing down. 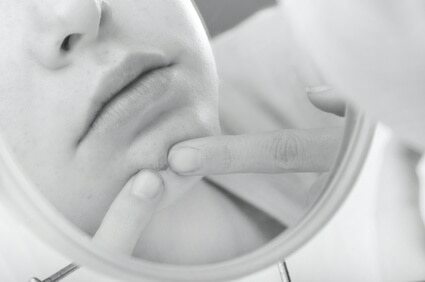 Often after squeezing blackheads you can see the pores you’ve just cleared – little open holes in your skin. Pores can’t be ‘closed’, but the following steps will help them reduce back to their normal size and keep them healthy. They are also important to reduce any redness or irritation from the squeezing…. Squeezing blackheads is oddly satisfying… and tempting to keep going and squeeze as many as you can! Keep in mind too much squeezing will aggravate your skin, so just target the ‘loose’ ones. Whenever I squeeze a blackhead I end up with an actual pimple the next day. What could be the reason to this? And is there anything I can do to prevent it from happening? Also, I have many comedones on my face (little white bumps that are the same colour of my skin), whenever I squeeze them I also get a pimple the next day. 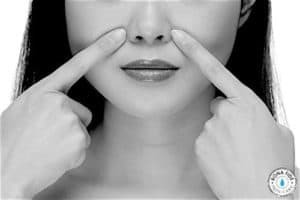 It could be a result of the squeezing – be extra careful about cleansing your face beforehand, using tissue to cover your fingers, and you could try applying a thin layer of rubbing alcohol after to disinfect and dry out the pore (rubbing alcohol on skin can be great!!). It could also be a reaction to the action of squeezing that causes inflammation, in that case I would not squeeze any more or do so VERY gently and only those that are “ready” and come out easily. Try using an exfoliant such as salicylic acid regularly instead, the results aren’t as immediate as squeezing but your skin sounds like it may really benefit from it. The little white bumps sound like milia, these are difficult to squeeze and it may be again a result of inflammation after doing so. Salicylic acid will help with these too. Because they are sort of “closed in” squeezing can be difficult, I would concentrate on using skin care to help clear up your skin and see a professional if you need them extracted. Why do professionals put the squeezed blackhead on their glove ? Although I only get out huge whiteheads and the occasional large blackhead nowadays, my husband says years of squeezing spots out of his nose has left him with an enlarged red nose (I can’t see it) with broken, bleeding capillaries that need laser treatment. He will ‘let’ me squeeze a huge, over-ripe whitehead out but that’s it. He says he is worried about his nose but refuses to see his GP for a referral to a dermatologist. At the moment we are barely speaking due to his shouting at me. Any advice?